Round 3 of the Southern Oregon Chess League was held in Sutherlin this Saturday and once again, Coquille dominated at both the Varsity and Junior Varsity levels. Coquille did not have a single loss on any board as they played against Marshfield, Myrtle Point, Sutherlin and Oakland. Coquille: Jessi Ross, Tasha Keller, Stephen Mast, Jasmine Lambson and Ivy Hallmark. Coquille: Aaron Grabinsky. Sarai Perkins, Kaden Johnson, Seth Lambson and Mason Collard. Extra Coquille players were brought for practice and to allow games to be played on absent boards. They also made up extra teams to fill in bye positions. Thanks Tanner Flood, Isaiah Hill, Dane Ramirez, Jenni Ross, Jacob Frasier, Josiah Perkins, Malachi Hallmark, Emily Clemons, Tyler Overby, Chelsea Reeves and Emily Terry. Medford area brought two players Collin Goldman and Devin Kruse to make up a pseudo team filled in with Coquille players. They won all their games except against Coquille. Between good chess playing and pizza, everyone had a blast! UPDATE: Full results at NWSRS. In the 4th round, Carlsen tried to play the English opening, but Nakamura wanted to play the Dutch. They argued about it over the board for several moves and settled on a Dutch-like English. Carlsen quietly, relentlessly, and effectively coordinated his pieces on the queenside and kept posing defensive puzzles for Nakamura to solve. At about move 30, Nakamura’s defense began to crack. By move 40, he was down a pawn and his position was shaky. A few moves later, he lost another pawn. Carlsen locked down Nakamura’s remaining bishop and pawn and methodically moved his king in front of his pawns to lead them down the board for the win. Former world champion Vladimir Kramnik beat up on the lowest-rated player in the event, David Howell. The surprising tournament leader Luke McShane drew against Michael Adams to maintain a share of first place. In the fifth round, Carlsen won yet again (against Howell). Nakamura also won, handing Short his fourth loss in five games. The other games were drawn. ﻿NOTE: Bilbao scoring is used for this event — win = 3 pts, draw = 1 pt. The games can be found at chessdom.com. There is a lot of additional information, including pictures, videos, standings, pgn downloads, stories, schedule, etc. at the official site. Monday is a rest day. Round 6 is Tuesday, and the final round is Wednesday. The Winter Open at the Portland Chess Club (PCC) is a grueling two-day event with five rounds. Why “grueling”? The time controls are so long that players can play up to 12 hours per day! This is a serious event for strong, seasoned players. As with most PCC events, a majority of the participants event were adults, but a number of Oregon scholastic players joined in as well, including Alexandra Botez, Calvin Parnon, Erik Skalnes, David Wen, Matt Dalthorp, Dhruva Chatterjee, Venkat Doddapaneni, Takuma Sato-Duncan, Pranav Sharan, and Maxwell Sun. Players rated above 1800 USCF (Alexandra) had to play in the Open section, but Calvin, Erik, David, and Matt all chose to play up even though they all had ratings below 1800. It takes guts to volunteer to play in a tougher section than required. Kudos for your courage, guys! Alexandra (10th grade, Clackamas High School), won it all, scoring 4/5. In the final round, she beat National Master Steven Breckenridge. Congratulations, Alexandra! Matt (9th grade, Crescent Valley High School in Corvallis) finished with an even score (2.5/5, including a half-point bye). Although at USCF 1507, he was the lowest rated player in the section by nearly 200 points, he ended up notching some impressive performances. In the first round, he toppled Jerry Sherrard for a 400 point upset. Matt played an English attack against Jerry’s Najdorf Sicilian. Jerry sac’d his b-pawn for initiative, but Matt coolly defended. In a sharp, complicated position, Jerry neglected his a-pawn, which Matt promptly scooped up and gained the initiative. Soon he won a third pawn. From there, it was, as they say, “a matter of technique.” Matt picked up nearly 100 rating points and made a strong case that he belongs in the Open section regarless of what Mr. Elo says. David (8th grade, Cheldelin Middle School in Corvallis) finished at 2/5. David was on the winning end of an intriguing matchup in the second round — Oregon’s #1 eighth grader (David, USCF 1744) against the #2 eighth grader (Erik, USCF 1680). Erik played a Najdorf, inviting complications and a sharp struggle. David gladly accepted the challenge, launching into an English attack with 6. Be3. David weathered the storm better and won in a R + B endgame. In the last round, David faced the powerful Paul Motta (1912). Paul played the dubious Elephant Gambit. Black sacrifices his important d-pawn with virtually no compensation beyond sending a message to his lower-rated, younger opponent: “I’m so much better than you, I can play a garbage opening and beat you!” David crushed him. Nice job! Calvin (9th grade, Crescent Valley High School and homeschool in Corvallis) also scored 2/5, beating Austin Chang (WA) and Sean O’Connell (OR) — both are great wins. Austin is an up-and-coming scholastic player from Washington. He struggles against players rated over 1800 but tends to play very well against 1700s like Calvin. But at the PCC Winter Open this year, Calvin flat-out outplayed him. In his other win, Calvin face an opponent (Sean O’Connell) who likes to play aggressive attacking games. So does Calvin. When the dust cleared today, Calvin emerged the winner. Erik (8th grade, Eugene) is a real fighter. He locks horns with the toughest opponents he can find and often comes out on top. Over the past year, his rating has averaged around 1600, but against opponents rated over 2000, he’s scored 2.5/5. Fantastic work, Erik! Unfortunately, most of his opponents at the PCC Winter Open this year were rated in the 1900s rather than above 2000, and it was rough tournament for him. He did manage a draw against Jerry Sherrard, who was over 200 points higher rated. Well done. In the reserve section (U1800) there were also five Oregon scholastic players. Maxwell Sun (5th grade, Hoover Elementary School in Corvallis) scored the highest (3/5) among all juniors in the reserve section. It all came down to the last round game against Dhruva Chatterjee (7th grade, Athey Creek Middle School in Wilsonville): the winner would be the the top scorer. Druva played the Catalan, a difficult opening that’s popular among recent world class players. Garry Kasparov, Victor Korchnoi, Vladimir Kramnik, and Viswanathan Anand all played it in world championship matches or semi-finals. It’s been an effective weapon for the likes of world champions Anand and Kramnik to beat number one contenter Veselin Topalov, but it’s a difficult tool for lower-rated players to wield. If you don’t believe me, try playing it against Max sometime. Dhruva was the second highest-scoring junior in the reserve section at 2.5/5, tied with his dad, Sandip. Also tied with Dhruva was Pranav Sharan (7th grade, Lake Oswego). In a tough-fought battle against Jerrold Richards, Pranav had only his king left to face Jerrold’s king + pawn. However, Pranav was able to show off a little of his endgame skill. He took the opposition for a draw (if you don’t know what “take the opposition” means, please read about it in an endgame book or ask your friendly neighborhood chess whiz about it. You’ll be glad you did.). Takuma Sato-Duncan (8th grade, Mt. Tabor Middle School) is relatively new to competitive chess. He played his first USCF-rated tournament this summer, but he is already one of the top eighth graders in the state. It won’t be long before he is battling David and Erik for the top spot. Venkat Doddapeneni (6th grade, Stoller Middle School) is another of those tough players that always seems to “play up”. It’s hard when the average rating of your opponents with established ratings is nearly 300 points higher than yours, but Venkat keeps battling them at every opportunity. He shows great courage and great heart. Keep up the good work, Venkat, and soon there won’t be any higher sections for you to play in because you’ll be at the top! On December 8th the Portland Area League members met for the 5th round. In the Upper Division first place Clackamas #1 got back on track and took care of Sherwood #1 by a score of 4 games to one. Second place Lincoln #1 ran into the emerging Horizon Christian team and went down by a score of 3 to 2. Fourth place LaSalle #1 was also taken down by Lake Oswego #1 only scoring a win on the last board. Fifth place Westview was fully manned this week but went down to Cleveland by a score of 3 1/2 to 1 1/2. Place School Match Pts. Board Pts. Lake Oswego and Sherwood postponed their first round match so those schools have played one less match in both division. Board #1 —- Bryce Eng of Jesuit with a prefect 5 wins in 5 matches. Board #2 —- Gaving Megson of Clackamas with 4 points out of 5 games played. Board #3 —-Tushar Sah of Jesuit who is also prefect with 5 points. Board #5 — Bryan Lucero of Clackamas with 4 points out of 5 games. Alexandra Botez of Clackamas with 3 wins in 3 games on board #1. Jordan Edelson of Lincoln with 4 1/2 points out of 5 competing on three different boards. Kevin Rhine of Clackams with a prefect 5 out 5 on three different boards. Ian Band of Lincoln with 3 wins in 3 games on three different boards. Zach Director of Wilson scoring 3 out 3 on two different boards. The league weighs each of the five boards differently using the square root of 0.8. For example a win on Board #1 is worth one point, while a win on Board #2 is worth 0.8 point, and a win on Board #3 is only worth 0.64 points. By league rules teams field their best available player on board #1, second best on board #2, and so. If a player is absent then everyone moves up and a replacement player fills in at the bottom board. For schools with two teams if the board #1 player is absent then everyone moves up a board and the individual playing board #1 in the Lower Division will play the 5th board on the Upper Division team. The League plays their matches every Wednesday (that Portland Schools are open) in the cafeteria of Lincoln High School. The matches begin at 4 PM and are over shortly after 6 PM. The Portland Area League is composed of 11 member schools that field 16 teams into two divisions of eight teams each. In the first half of the season, each division plays a round robin of matches with five-player teams. Then, divisions are adjusted somewhat and the divisions play another round robin in the second half of the season. The fourth round was played on December 1st and the Upper Division first place Clackamas #1 was upset by Horizon Christian winning on the top three boards while droppping the bottom two. Second place Westview was also taken down by Lake Oswego #1 by a score of 4 to 1 (Westview had to forfiet the bottom three boards as some of their players did not make an appearance). Third place Lincoln #1 held off Cleveland by a score of 3 to 2. Fifth place LaSalle #1 scored a 3.5 to 1.5 in the remaining match. In the Lower Division first placed Jesuit rolled over Access Academy by winning the top four boards while losing the last board. Second place Lincoln #2 was taken apart by Lake Oswego #2 scoring only drawson boards 3 and 5. Third place Clackamas #2 was beat 3 to 2 by Wilson when their first board lost on time while up two Queens. Fifth place LaSalle #2 also lost a close one to Sherwood #2 by winning the top and bottom boards while losing the three in the middle. Christopher DiMarco playing board #4 for Jesuit. Wunderkind (wonder child) Magnus Carlsen goes down again — this time to world champion Anand. Carlsen just turned 20 a couple weeks ago. Just after his 19th birthday, he became the youngest player ever to be the number one rated player in the world (Jan 2010). The next world champion? Two months ago, it looked like he was on the inside track. He won several very strong tournaments in 2009 and 2010 and earned a spot in the Candidates Matches in spring 2011, with the winner to challenge Anand for the title. But he pulled out of the matches, saying that he didn’t feel motivated and that he’d rather see the world championship decided in a tournament rather than a challenge match. The game continued for another 45 moves, but there was never much doubt about the final result after Anand’s nifty little combination to get the superior position. NOTE: This event uses the “Bilbao scoring” with win = 3 points, draw = 1 point, and loss = zero. Nakamura is still young, but he has rocketed to the highest levels of the chess world. He’s now making a strong case that he belongs there. Yesterday he drew against world champion Anand. Today he beat former world champion and current world #4 Vladimir Kramnik — and was playing black. Kramnik rarely loses, especially on white. The game was a strange one, with Kramnik blundering a piece in the opening. 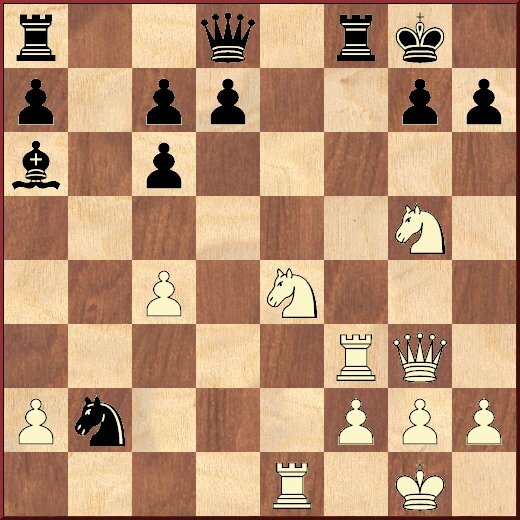 To win the piece, though, Nakamura’s king was exposed to attack, and his pieces were left tangled in knots. It was just a matter of time until he freed his pieces to win. Following up on his surprise win over Carlsen yesterday, McShane was not satisfied with a draw today. He played the Sicilian Dragon, an opening that is famous for double-edged tactical positions. Short responded with the ultra-sharp Yugoslav Attack. 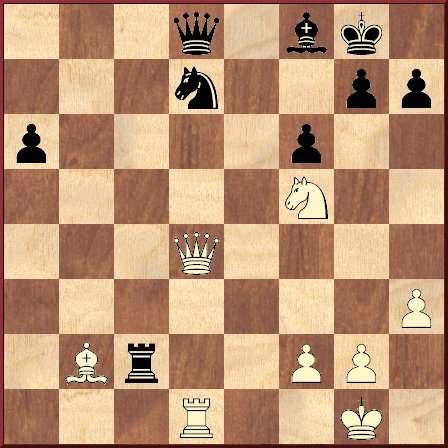 In vintage dragon style, McShane parried the threats to his king and then systematically began plucking off Short’s pawns. Short resigned just before McShane promoted one of his extra pawns. After yesterday’s loss, Carlsen rebounded with a win over Adams. Adams had an advantage coming out of the opening with a nice queenside attack. Then, he began migrating all his pieces to the h-file, and Carlsen promptly thumped him. For the second day in a row, the world champion worked up a sizable advantage but was unable to find a way to win. Howell defended accurately and earned a long, hard-fought draw. Another Berlin! Unfortunately, Howell ignored Kramnik’s lessons from his match with Kasparov and tried playing an old-fashioned version. Adams sac’d two pawns and a knight and shredded him in a blistering attack against the king. Englishman McShane played the English opening in England and thoroughly outplayed Norwegian super-star Magnus Carlsen in a big upset. McShane played a creative, energetic game. A clever maneuver (see diagram) gave him the advantage, and he never looked back. 22. Na6! A surprising and beautiful move. 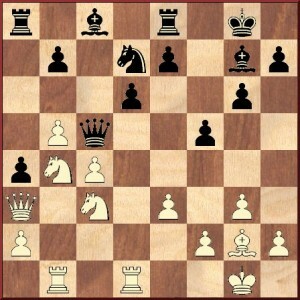 After Black captures the knight, White keeps moving his pieces forward and strangles the black pieces in the corner. White first wins a knight, then a pawn, and finally a rook for a knight. Game over. Short played an old-fashioned bishop’s opening against Kramnik to try to throw him off. I think Short already knew this, but Kramnik is not the kind of player you can beat with cheap tricks. Short wanted to play a patient, strategic game, but Kramnik turned it into a swashbuckling, all-out assault on the white king. With checkmate looming over him in a few moves, Short resigned on move 38. Vishwanathan Anand (from India, World champion and world’s highest-rated player), Magnus Carlsen (from Norway, second highest-rated player in the world), Vladimir Kramnik (from Russia, previous world champion, fourth highest-rated player), Hikaru Nakamura (from USA, highest-rated American player), and the four strongest British players (Michael Adams, Nigel Short, Luke McShane, and David Howell). The British players in the tournament are very strong, but none have a strong chance of winning the event. McShane and Howell are on their way up the ratings list, while Adams and Short are on their way down. Games are broadcast live at ChessBomb, while the official tournament site has more complete information. For eleven straight years, Jerry Ramey has directed the Fall Classic scholastic chess tournament in Eugene. The name has changed over the years, but it is consistently a high quality event, year in and year out. This year 60 players from all over the state (and even one from Washington) participated. Playing in the elite section this year were the three highest rated ninth graders in the state (Calvin Parnon, Matt Dalthorp, and Jack Dale), the second highest rated eighth grader (Erik Skalnes), the highest rated fifth grader (Maxwell Sun), along with Freddy Davis from Vancouver WA, Jimmy Kelly from Eugene, and Tyler Mccausland (winner of the Eugene Spring Fling in April, 2010). Going into the final round, Max was sitting tall on a perfect 3/3, while Erik and Matt were tied at 2/3. Max played a turbulent Albin’s Counter-Gambit in the final round, but Erik coolly ramped up the pressure in the center and won handily. The players ended the tournament tied at 3/4. Matt had hopes of catching them in the final round, but Freddy’s Accelerated Dragon had him befuddled. He quickly found himself down a rook for two minor pieces. At the same time, Freddy’s pieces were active and well-coordinated. He finished the game methodically and masterfully to tie with Matt at 2/4. Matt’s loss created an opening for Jack, who got an advantage against Tyler in the middle game and successfully ground him down in a rook endgame to finish in third place at 2.5/4. Simon Venter recently moved to Eugene from southern Oregon and won the advanced section with 4.5/5 score, a half-point ahead of Jared McReynolds of Cottage Grove High School and Derek Wang of Eugene. In the intermediate section, Chase Kephart from Cottage Grove cruised through his first USCF-rated tournament with a score of 4.5/5. Griffin Allensis of Eugene finished second at 4/5. Not only did he earn 2nd place with his score, but he increased his USCF rating by a whopping 343 points. Nice job, Griffin! Not many players add that many points in a full year, and you did it in one day. Miles Pendleton from Eugene finished in third at 3.5/5. Topping the novice section was Jack Woo Mclain with 4.5/5. Right on his tail at 4/5 were fourth graders Andrew Dassonville and Avi Shugar. This was Avi’s first rated tournament. He ended up losing his very first tournament game, but then roared back to win four in a row to tie for second — Fantastic debut performance!